Today’s Prompt: Imagine you’re a superhero. Describe a day in your life, in the first person, in a realistic tone. What is your cover, what is your superpower, how do you exercise it, who knows your identity, what is your “kryptonite”? When finished, re-read and notice if there are any similarities or relatable details + hints between this fiction and your real life, deeper story, mission, dreams, pain and passion. 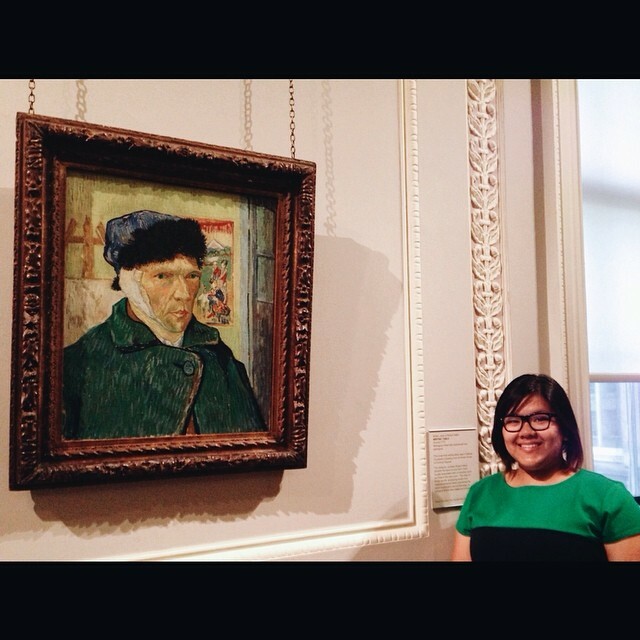 With Van Gogh at the Courtauld Gallery, London, August 2014. They call me The Historian. I look like you, walk like you, talk like you, dress like you. Behind all that, however, is something far more significant. I possess knowledge of the past, whose detail is so significant that I can literally feel it in my bones. When I close my eyes, I’m there. I can see, feel, taste, and hear everything from any given time period. I live it. Appreciate it. I am but a witness however. A fly on the wall, of sorts. I cannot undo what has been done or change the course of the future. Only my very best friends know the truth of my abilities, and if I’m not careful, all the knowledge can overwhelm and disable me. When I channel the past (imagine Bran Stark when he wargs), I am susceptible to harm… so I keep myself away from others’ notice when I do so. When I look at this… it mirrors the real me in many ways.When I study topics, I truly immerse myself in it all. I love to travel to places and be where the history is, feel it around me. When I geek out over history, I usually keep it to myself, or reserve it for a select few friends, because I otherwise get mocked, teased, or hurt by others for it. It’s funny how life imitates art.